emmatree: first, louisiana . . .
a few minutes before the cold cold front moves in. but i will be gone. i am heading for a beach somewhere. phobias and anxiety and all. it is the gift she gave me on her leaving. but there may also just be words. to spend time with new blogging friends. -:) ...and don't get caught speeding in Louisiana! Oh, I am so glad you are gifting yourself with water, wave & (hopefully!) warmth. Enjoy your trip & meetings with fellow souls. Sounds wonderful. Enjoy the beach. Good for you! 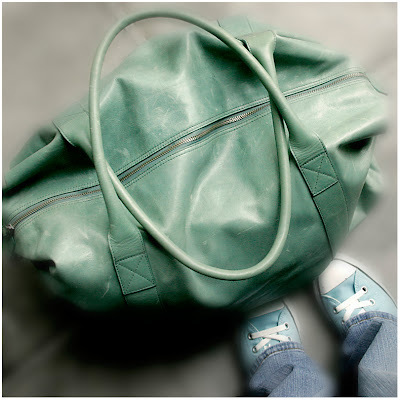 Have a wonderful trip to the beach, and oh, how I love that green bag and those runners. so proud of you!! next week, you will not be the same person. this is the definition of courage. I will meet you Monday, at the end of your fabulous drive. There will be hugs, laughter, understanding and great girlie time waiting for you there ! Can't wait to meet you and give you that huge congratulatory hug ! oh debi....i just can't wait ! I just knew you were going to see beth. Hug her for me! Have a totally wonderful time and don't forget to jump. Traveling by yourself can be a bit intimidating at first (I was nervous about going to Italy by myself), but it is also liberating. You can just feel yourself stretching in ways you've never stretched before. I'm sure Maggie would be proud of you, setting off boldly on this adventure. I have been dreaming of a beach lately, thinking it is something my soul is craving. I look forward to reading of your travels so I can enjoy the waves and the sand vicariously through your words and photos. So this is what sweet Beth was talking about on her blog! How wonderful that you get to connect...and on a beach!! Near the ocean! Just came from Beth's blog after reading about your wonderful adventures. I love your bag here! Love it. So glad you had a good trip.